Toyota has revealed the first image of its forthcoming Yaris hybrid, a model that will be showcased at the Geneva motor show in March. The firm has also confirmed that its larger Prius model will be a seven-seater in European markets. 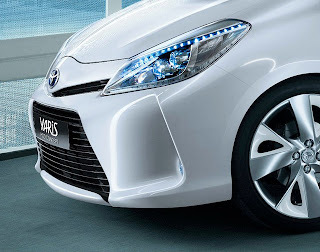 The Yaris teaser image, revealed via a company blog website, shows the nose of the car. It’s clearly a development of the model that was revealed recently in Japan as the Vitz, although there are slight changes to the grille (now deeper) and the headlights, which feature strips of LEDs. There’s also a hint that the intake-esque elements at either side of the bumper will house LED lighting. The Yaris hybrid is expected to go on sale in 2012, and it will be produced at Toyota’s factory in Valenciennes, France. It’s likely to get a much smaller petrol motor as part of its powertrain; expect it to use a 1.33-litre engine instead of the 1.8-litre unit used in the Prius and Auris. Toyota also issued a photo of the larger Prius’s badging. It confirms that the car will be called ‘Prius+’ instead of the ‘Prius v’ that will be used in the US. And the blog promises “the versatility of seven seats”, indicating that the European model will be able to cope with more passengers than the five-seat US version. Both models are being lined up for European debuts at next month’s Geneva motor show.